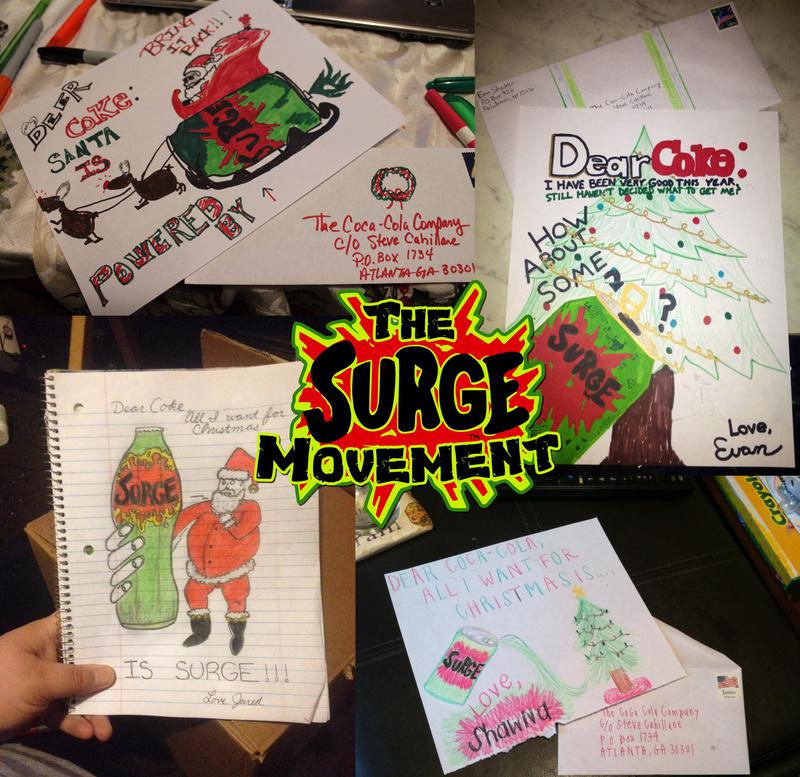 The SURGE Movement is a fan-powered community recognized for the return of SURGE, a citrus soft drink produced by The Coca-Cola Company that was resurrected in 2014 and formerly available from 1997-2003. The Movement remains an integral driving force of interminable activism, focusing on the brand’s growth, success, and sustainability. 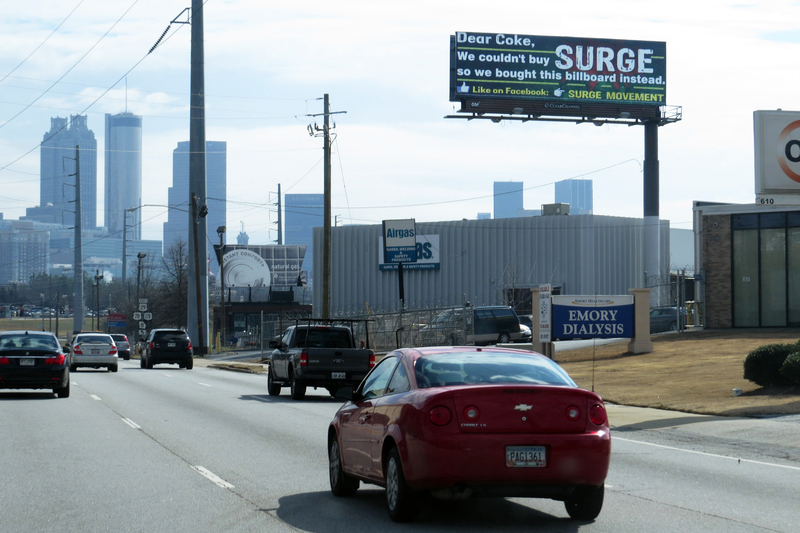 SURGE is a soda brand released in early 1997 by The Coca-Cola Company with its first commercial airing during Super Bowl XXXI. Being heavily marketed upon release, its purpose was to put a large dent in our nation’s citrus market and provide consumers with a bold and irreverent, yet tasty alternative to Pepsi’s Mountain Dew. Bright green in color, SURGE was described as a “Fully Loaded Citrus Soda with Carbos,” meaning it boasted a blend of bold citrus flavors and maltodextrin (a less sweet carbohydrate), which when combined with its low carbonation, produced a bold yet smooth taste. 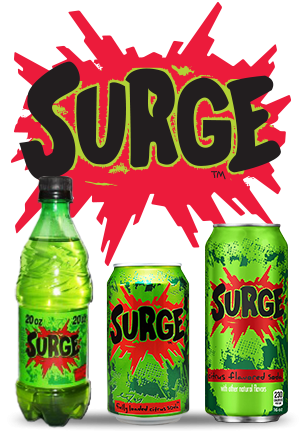 SURGE caught on quickly and was initially available in 60% of the nation, spreading to 90% by early 1998 in which it quickly became a cult-classic choice among many. 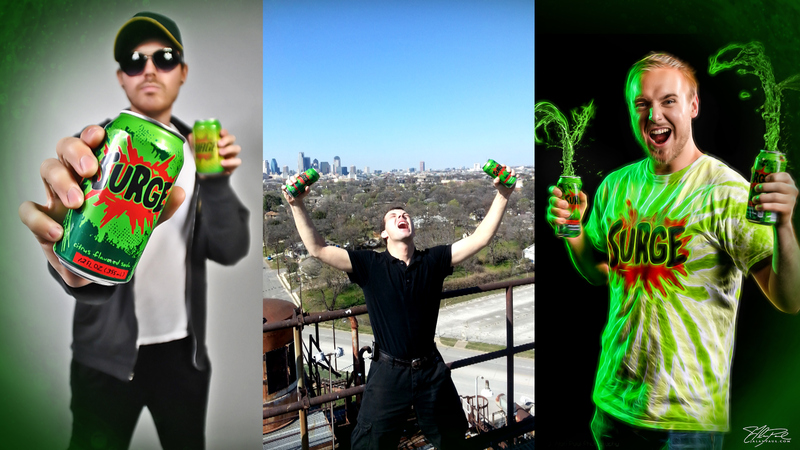 SURGE’s early days saw an era before energy drinks were mainstream (before Red Bull, Monster, etc.) Advertised with “Extreme Lifestyle” marketing that featured many recognizable commercials, SURGE often featured intense races to a single can or bottle. SURGE quickly became an iconic brand– so much that 97% of teens were aware of SURGE in the initial launch markets and 95% had tried it at least once, based on internal consumer research. In April of 1998 the head of Coca-Cola's marketing department, Sergio Zyman, resigned from his post and the reigns were handed over to Charles S. Frenette, a man generally seen as having the complete opposite approach to marketing. The very next month, Coke's stocks reached their peak and began to plummet. SURGE began to see a decrease in sales which continued until 2003 when Coca-Cola decided to cease all forms of its production. Coca-Cola decided against a reformed marketing plan, despite continuous efforts of its passionate fan base. Even before the discontinuation, community websites such as SaveSURGE.org had risen and become ground zero for SURGE fans to unite and also express their creative side. Led by Eric "Karks" Karkovack, Save SURGE featured a petition that gained over 30,000 signatures, a SURGE map to find remaining SURGE locations, hundreds of user-submitted artwork/recipes and a bulletin board for communication among other powerful assets. The persistence and passion for SURGE never died and fans actively remained unrelenting in its return. That continuous activism finally led to a response in 2005, where Coca-Cola announced they will be releasing a new citrus soda named VAULT, which had a different formula with higher caffeine and a higher carbonation. Mourning SURGE fans reacted with mixed emotions because VAULT was not SURGE, and it was evident they would never co-exist so long as VAULT was on the market. The hope of SURGE fans slowly faded away until late 2011 when VAULT was also declared a discontinued brand. In December of 2011, Evan Carr of San Jose, CA founded the SURGE Movement on Facebook, shortly before bringing on Matt Winans of Fargo, ND and Sean Sheridan of Murphy, TX. Through the power of social media and pure grassroots strategy, the SURGE Movement community and its administration coordinated their guerrilla marketing efforts with a goal of influencing The Coca-Cola Company to reverse their decision and bring SURGE back to the market. The Movement’s endgame, however, was never just the reintroduction of SURGE soda, but its sustainable, long-term success and profitability, earning it a permanent placement in the Coca-Cola Sparkling Beverage lineup. This administration trio worked tirelessly for years to bring back a soda that they all missed dearly, but their job wasn’t to create demand, it was still there – and over a decade later – a fact that was very apparent as the Movement grew. Their job was to muster and lead this fast-growing legion of like-minded individuals aspired on the brand's revival and prosperity. It didn’t take long for the Movement to pick up steam. Quickly, the page was averaging over a thousand new fans per month with occasional surges (pun intended) of up to 5,000. Best of all, this early growth was attributed to none other than word-of-mouth which honorably illustrated the aptitude and potential of what lied ahead. As the Movement grew, so did its impact on The Coca-Cola Company who began to recognize the Movement and sincerely value their passion for the lost brand. In understanding this level of loyalty and commitment, one fact was quite clear: the nation wanted SURGE back in their lives and Carr, Winans and Sheridan were there to strategize and facilitate. The Movement’s Facebook page would make regular requests for fans to get in touch with Coca-Cola’s Consumer Affairs hotline to request that they bring back the legendary soda. Calling en masse eventually became known as “SURGE Coke” days and started a trend of organized teamwork that typically took place on the last Friday of each month. Allegiant others called every day. This grassroots effort created a sense of community spirit and determination centered on lighting up Coke’s phone lines with product requests and reporting back with their results (e.g. “Customer Service Rep Dale answered my call and sternly said that Coke has no plans of ever reviving SURGE Soda”). Making the “SURGE Coke” days an organized event gave the Movement’s supporters a special event to look forward to, while ensuring that they would generate new callers each month as the Movement continued to grow and engage a large diversity of soda drinkers via Facebook’s Organic and Viral outreach. However, this event was one of many more to take place. A multitude of grassroots efforts were brought about in the revival process to increase exposure of the Movement and its mission. Exactly 15 Organized Events were created that were often made into a contest with awards and giveaways to incite the highest volume of participation. Some of the giveaways included SURGE can koozies, stickers, vending machine labels, expired syrup, along with Coca-Cola brand 12-pack vouchers, the preceding Norwegian soda URGE, and more. The events involved anything from promoting "SURGE Coke" days, to creating/hanging flyers, writing handwritten letters, and even SURGING other channels such as third-party Facebook pages, celebrities, radio outlets, and media agencies. All of these played an important role in the Movement's presence and community growth. On top of these ongoing efforts, critical fundraisers were established. The billboard campaign included 143 total contributions with 118 total contributors, 43% of which donated $50+ and as a perk, had their names printed on the actual billboard’s footer. The message on the billboard was thought up by loyalist Chris Mace and voted on by other members. This community boldness and creativity resulted in front-page featured stories of widely recognized news sites, such as CNN Money, Business Insider, Yahoo! News, in addition to the cyberspace phenom BuzzFeed. The billboard played a critical role in gaining new media attention and though it was an early feat, it forever became an iconic milestone in SURGE Movement history. Later in 2013, the Movement administration proceeded with a new campaign titled the “Syrup Fundraiser,” distributing a total of 525 2oz SURGE syrup samples for $20 apiece to 322 different households all over the nation. This was accomplished using the contents of four extremely rare 2.5gal SURGE fountain syrup boxes that were dispensed with a bag-in-box tap valve. Each 2oz bottle of syrup could then be either kept for memorabilia, or combined with 10oz of club soda or seltzer to make one 12oz serving of fresh SURGE. 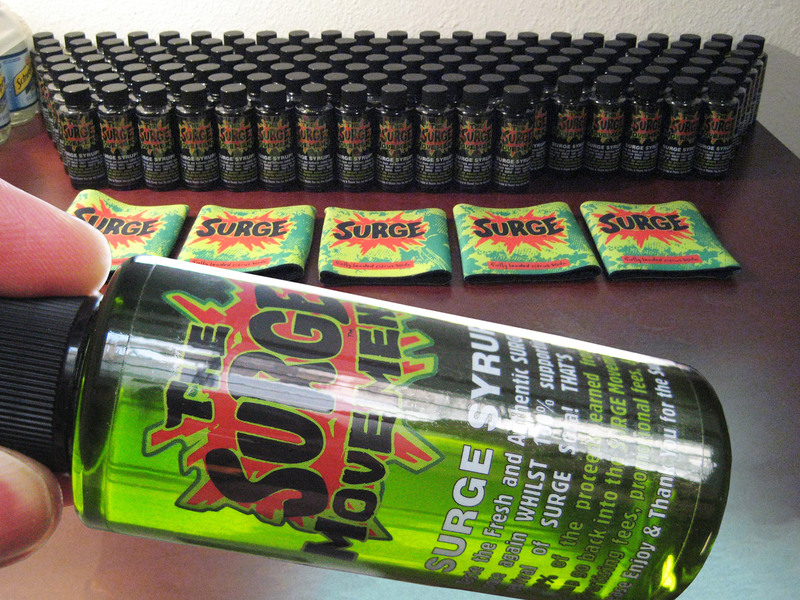 The fundraiser was another huge success as the SURGE syrups sold like wildfire, the last 200 selling out in just six hours. At one point, the process also brought about a unique opportunity to help a charity in need called Mercy Outreach, "ministry to the poorest of the poor, handicapped, orphans and widows." As a gesture of good faith, the Movement would receive this very domain name (surgemovement.org) they had owned for their youth group but didn't need. The Movement responded by fundraising $700 for the non-profit 501(c)(3) organization in one day via Indiegogo.† A combination of these fundraising efforts and organized events with steady activism would eventually allow the SURGE Movement to adequately showcase the brand’s incessant modern-day demand. Evan, thanks for your ongoing interest in Surge. We are working on a plan to make Surge available again by popular demand and we will follow up with you as soon as it's ready. Thanks. With the encouragement of various departments in tandem with the Movement's incessant drive, the planning had begun. It was official: SURGE would be back! The hard work of the hundreds of thousands who stuck with the Movement would finally be paying off and their dream would be fulfilled. That surprised relief with tears of joy turned to devout determination and the administration collectively shifted gears with an additional proposal that ensured the Movement would see involvement in carrying the SURGE brand to success. Discussions with the project leaders in regards to the strategy followed, along with a trip to the headquarters to film the Official Announcement. †In fulfillment of the Mercy Outreach 501(c)(3) charity fundraising perk, ownership of this domain (surgemovement.org) was made possible through the support of the following contributors, among other generous contributions: Mike Spray, Eric M. Brennan, Nathanial Howard and Matt Winans.